Shatterproof clear tray manufactured from Acrylonitrile/Butadiene/Styrene ‘ABS’. The Glide & Tilt system holds trays open in an angled position to aid use, while trays are made from a super-tough, shatterproof polystyrene and are suitable for both the Medical & Education range of trolleys. 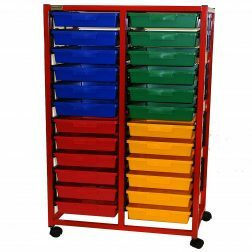 Bedford’s range of Tray Storage Trolleys are among the safest, toughest storage solutions in the marketplace and represent great value for money.